London : Printed by the Companie of Stationers, 1650. Purcased with the Toovey collection, 1899. 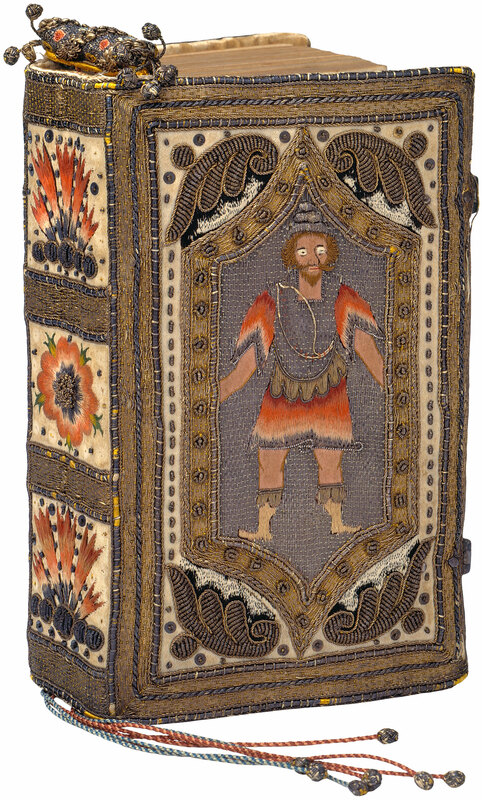 Embroidered in gold and silver thread with a full-length figure in a panel on each side, with the original book-marker, enclosed in a silk bag in a niger case. Ellen Childe, "her Booke", 1653 (front fly leaf recto); Elizabeth Holder, "her Booke", 1697 [in a later hand:] died 3 July 1732; James Toovey, bookdealer, Burnham Abbey booklabel; Pierpont Morgan Library, purchased with the Toovey collection, 1899.